Sixty-eight-year-old pensioner Pat Ainsworth tells BBC Sport why she is running her 18th London Marathon and shares her secrets for success. 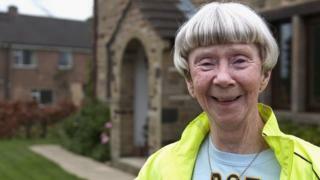 Yorkshire-based Pat first ran the 26.2-mile event in 1995 and admits that soon after finishing she realised she had "got the bug". She is aiming to finish within six hours, but says "enjoying the day" is more important than her time. If you want to take up running, check out our Get Inspired hints and tips page, and you can even join up for next year's marathon.